In 2007 the Al-Anon Chairperson was made a voting member of the SCV Convention Steering Committee (Position #15). The AL-Anon Chairperson oversees a committee of Al-Anon representatives that assist in helping carry-the-message about the convention as well as fundraisers that give the Al-Anon community in Santa Clarita the opportunity to have direct participation in the support of the convention both financially and in spirit. 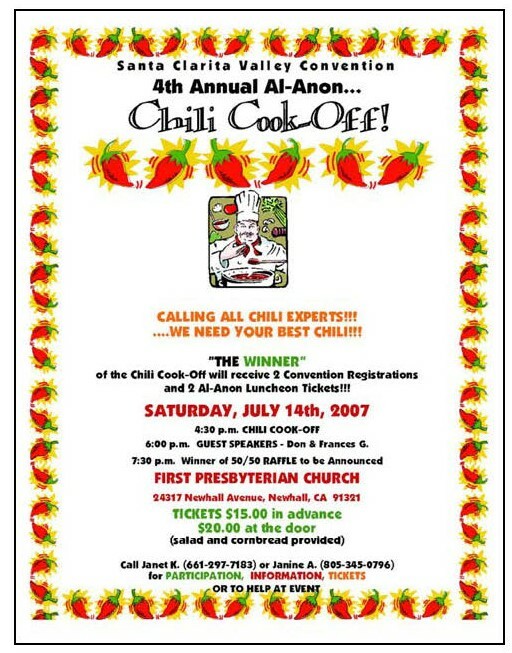 A common Al-Anon themed fundraiser in the past has been the Al-Anon Chili Cook-Off and occasionally a private dinner hosted by the Al-Anon Chairperson.